Valentines Day wedding themes give you lots of options. 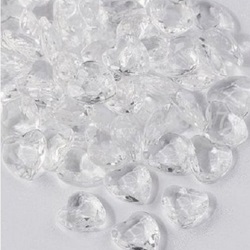 If there is a holiday designed for love, it is Valentine’s Day. You may think that you are stuck with soft pinks or vibrant reds with crisp white as an accent color, but you can also think outside that box to create unique color combinations for your big day. For instance, you may decide to blend the Valentine’s Day theme with the spring wedding theme. This gives you a mix of red and pink hearts, colorful spring flowers and winding green vines to create interesting decorative features. 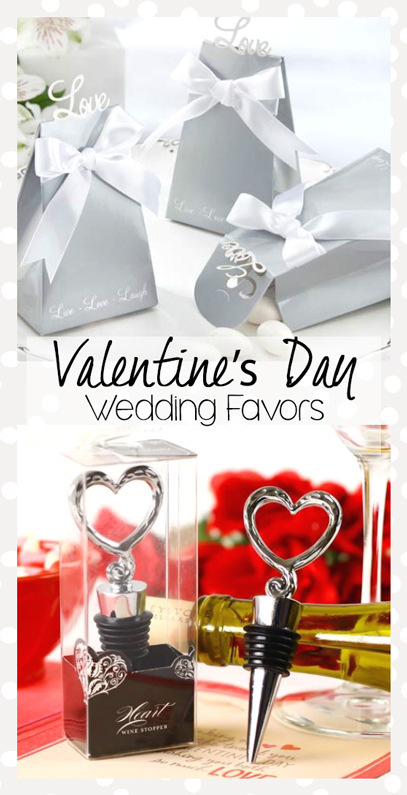 You can draw some decorating and color scheme ideas from the Valentine’s Day wedding favors featured on this page. 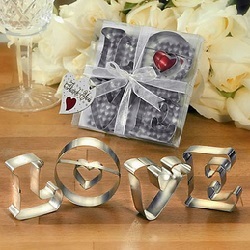 These favors are durable, functional and adorable, so they fit perfectly with your Valentine’s Day-themed wedding. 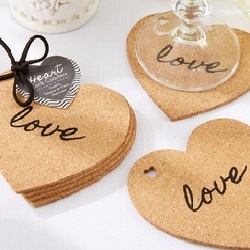 Heart-Shaped Cork Coasters - These simple yet elegant coasters are a dream come true for any bride shopping on a tight budget. Simple brown cork is cut into heart shapes and stamped with the word “love” in black. Small heart cutouts are featured in one corner, making it easy to add a ribbon or bow for a more festive look. These are perfect for pulling together a decorative table design, and your guests can take them home and use them on their coffee tables. 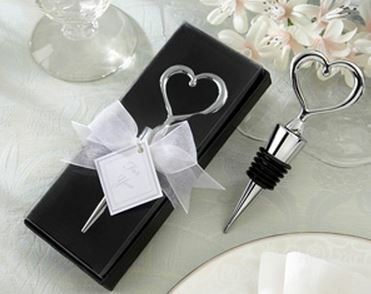 Open Heart Wine Bottle Openers - Wine goes naturally with Valentine’s Day. These chrome-layered bottle openers are elegant and shiny, and they feature decorative hearts that all of your guests will enjoy. 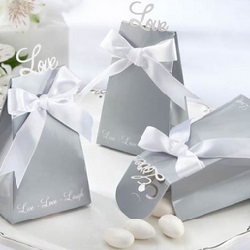 You can hand these out at your reception bar, set them on the tables as decorative accents or simply place them in baskets with other Valentine’s Day wedding favors so that your guests can choose what they want to take home. 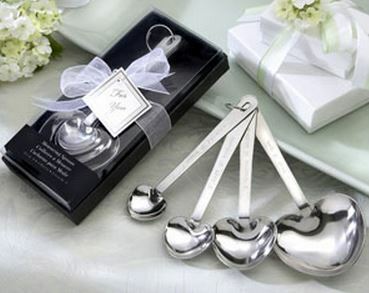 Heart-Shaped Measuring Spoons - These measuring spoons are adorable as well as elegant and functional. The spoons are made from stainless steel, and each one has a loving quote etched into the handle. Each favor comes in an individual box topped with a decorative bow. This is a favor that you can set out without assembly, so you won’t have to waste time creating your own decorative favors. Everyone can use a new pen, and these elegant silver pens will remind your guests of your special day every time they click the end. 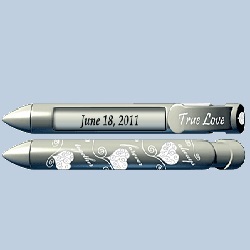 Each pen is engraved with hearts and the words “true love,” and you get to select the font for the personalized message. 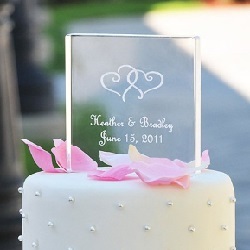 You can go with your names and the date of your wedding or come up with another unique message just for special wedding guests. This is an excellent favor for members of your wedding party, parents of the bride and groom or other guests deserving special attention. These chrome key chains are simple, yet they are also quite elegant. 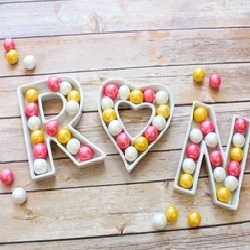 The hearts overlap for a decorative look, and your guests can use them in a variety of functional ways. 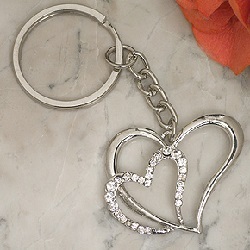 The small size of these key rings make them perfect for tucking into favor boxes or small baskets if you don’t want to fill those items with candy or mints. 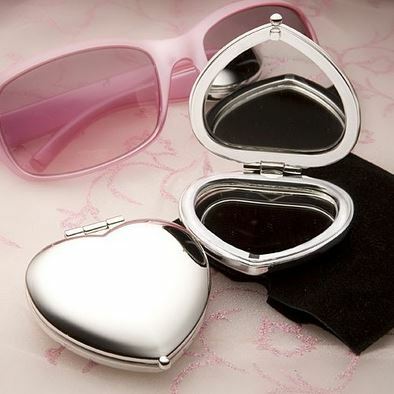 Heart Shaped Compact Mirror - This silver metal compact mirror will find its way into every female guest’s purse before the night is out. This is a fun item that girls and women of all ages will enjoy, and you can always find another favor that suits your male guests. 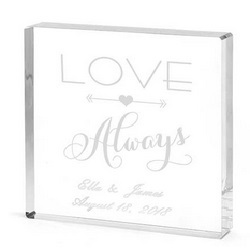 Surprisingly, this adorable giftare affordable for most wedding budgets.